Today, 20th June, 2016, the leader of the Indigenous People of Biafra (IPOB), director of Radio Biafra and Biafra TV, Nnamdi Kanu (POC), will be appearing in Abuja High Court, to continue the total exposure of the corruption of the Nigerian Judiciary. While we await the proceedings which will be presided upon by the very corrupt John Tsoho of the federal high court, Abuja, we expect him as usual to exhibit more blunders which apparently is inherent in him. We, the Indigenous People of Biafra (IPOB) know that our leader Nnamdi Kanu cannot get justice from a Nigerian Court under the government of Dictator Muhammadu Buhari. Since the arrest of our leader, Nnamdi Kanu, each of his Court sittings has really depicted Nigeria as a Zoo as he rightly called them, and has exposed the dictatorial nature of Tyrant Muhammadu Buhari who since his assumption as the president of the contraption called Nigeria, has collapsed everything that made Nigeria a country. It will be recalled that Judge Ahmed Mohammed had previously discharged and acquitted Nnamdi Kanu, after Judge Ademola Adeniyi granted him bail in Abuja. But Dictator Muhammadu Buhari refused to obey court rulings and ordered his errand boys, the DSS to keep detaining and torturing him, until Judge Tsoho who accepted to be a willing tool in his hand to jail Nnamdi Kanu came along. But unfortunately for him (John Tsoho), with Nnamdi Kanu, it is no longer business as usual, because God is interested in this case. It will be recalled that John Tsoho had previously ruled that masked witnesses will not testify against Nnamdi Kanu, but in another court sitting, reversed himself without an appeal by the prosecuting counsel to the Nigerian government, which points to the fact that he was biased. 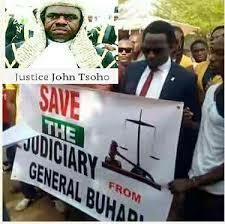 Read also:WILL JOHN TSOHO UPHOLD OR BETRAY HIS SWORN OATH OF OFFICE?....We Are About To Find Out! It is now crystal clear to the world that Judge John Tsoho is working on the order/instructions of Dictator Muhammadu Buhari who had earlier stated in a media chat that he would not release Nnamdi Kanu because he had dual citizenship. The Chief Justice of Nigeria is an accomplice to this injustice against Nnamdi Kanu. Muhammadu Buhari is obviously clueless together with everyone following his evil instruction that works against human right and humanity. And as long as Nnamdi Kanu appears in Court, this evil will continue to be exposed. Free Nnamdi Kanu, Free Biafra!